A clean-up operation is taking place after dozens of firefighters had to tackle three separate blazes in Edinburgh on Friday night. 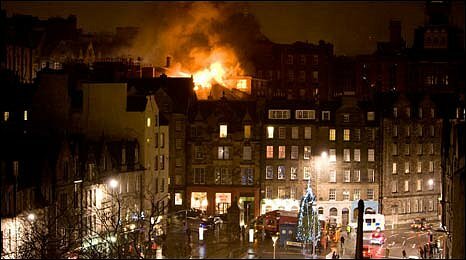 Hundreds of people had to be evacuated when a major fire broke out at an Indian restaurant on Victoria Street in the Grassmarket area of the city. Crews also tackled a blaze at a hairdressers on Frederick Street and a sheltered housing complex in Liberton. Lothian and Borders Fire and Rescue Service said there were no injuries. Joint investigations into the fires are being conducted by the fire service and Lothian and Borders Police. A spokesman described the scene at Khushi's Indian restaurant as "chaotic". The alarm was raised at about 2010 BST on Friday, one witness said 20ft flames had been coming from the roof of the building on Victoria Street. Victoria Street was cordoned off while fire crews brought the restaurant blaze under control. 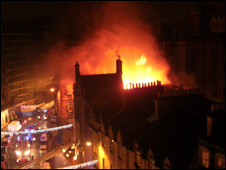 Eyewitness James O'Brien, 28, told the BBC Scotland news website that flames were shooting out of the roof of Khushi's. The building also houses the Liquid Room nightclub. "There were apartments with their lights on which had all been evacuated," he said. "Everyone was standing around outside talking on their mobile phones and saying how they could not believe what had happened. "I was coughing and choking from the smoke just walking past, and there was water pouring down the street from the hoses that the fire crews were using." Medical student Rupert Bright, 24, said he was first alerted by the smell of burning. "I looked out of the window and saw the roof of the building on fire. The flames were lighting up the sky," he said. "I went outside and there were several hundred people being kept away from the area by police - many of them were from the restaurants on the road. It was pretty hectic." Mr Bright said the main section of the roof had collapsed and firefighters had been on raised platforms spraying water on the front of the building. John Dickie, from Lothian Fire and Rescue Service, said the fires put the service at full stretch. "It did push us at a particular time. We had seven pumping appliances at one, five pumping appliances at another and while those two incidents were ongoing we had other minor incidents throughout the area as well." A spokeswoman for Lothian and Borders Fire and Rescue Service said Victoria Street remained closed to the public and firefighters were continuing to dampen "hot spots" on the roof using a hydraulic platform. She described all three fires as "major". Diners were evacuated from Khushi's, but it was not known how many people had been inside at the time. "It has been chaotic, but we have pulled out all our resources. Very, very thankfully, there appear to have been no injuries," the spokeswoman added. Ambulance staff confirmed no-one had been taken to hospital. Just under an hour after the incident, fire crews attended the second fire in the basement of a hairdressers in Frederick Street, off Princes Street. Residents were evacuated from a nearby B&B. Elsewhere, 14 firefighters tackled a blaze at a sheltered housing complex on Moredun Park Street. It was thought to have been caused by a chip pan. A 65-year-old woman was rescued from the property.